You can now embed fundraisers directly into your website. Click the embed link in the sharing options to get started. Join us for our Kid's Camp! Each child will experience all 4 gymnastics events (vault, bars, beam, floor), as well as the Tumble Track. 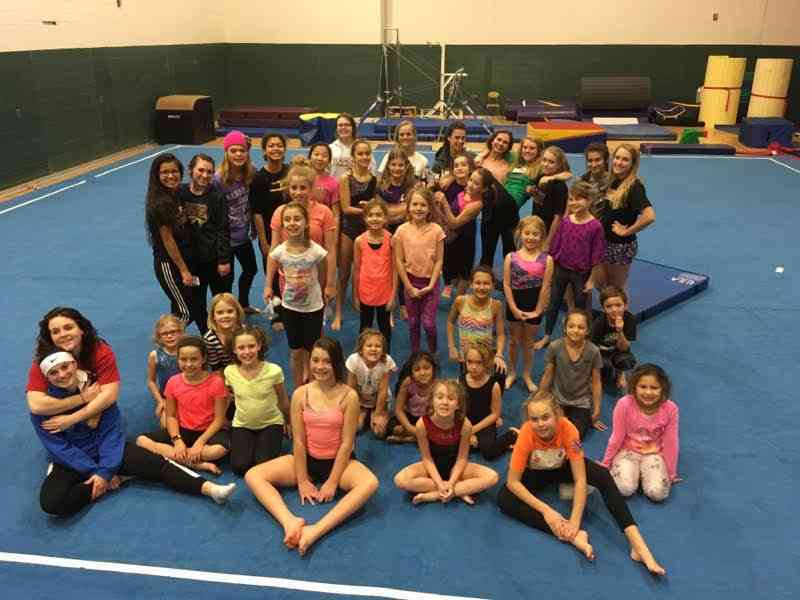 The High School Gymnastics team will be working with the children to introduce them to the sport of gymnastics and create a fun, safe, atmosphere. Children are asked to wear gymnastics apparel or t-shirt and shorts for the camp, no shoes are required. We hope your child can join us for this experience! $10 registration fee-Funds from the camp will be used to purchase new gymnastics equipment for the high school team. A waiver will need to be signed when dropping the child off at the camp-Registration will begin at 8:30 AM. Thank you for your support of our program! Who is managing the event? $10 ticket to attend our camp! Refunding this transaction is irreversible. Deleting this post is irreversible. Flag this post as inappropriate and notify school administrators. Flag this image as inappropriate and notify school administrators. Flag this message as inappropriate and notify school administrators. The content has been successfully flagged as inappropriate. Classmunity administrators have been notified and will investigate the incident. Your promoter page has been successfully created. You are now ready to begin accepting referrals for this fundraiser. You already have a promoter page for this event. © 2019 Classmunity, LLC. All rights reserved. You must specify at least one ticket to proceed. You must specify at least one product to proceed. Changing the email address will also change the user associated with this donation. Join Classmunity ? Sign up user ? Referral code / email (optional) ? Credit or debit Digital wallet ? You will be able to review your order before confirming. This charge will appear on your credit card statement as "CLASSMUNITY FUNDRAISER". Now that you are registered, perhaps you would like to make an additional donation to support this fundraiser? Thank you. A receipt has been emailed to the address provided. Supporter: Person who provides funds to your campaign. Campaign Founder(s): The person, people, or organization who is/are raising funds. Founder Space: The Founder Space is all the tools and resources that Classmunity is providing to you to fund your campaign. This includes the website, website data, online payment method, contacts, and assistance. Campaign Founder Consent: Any campaign related content that you upload to the site, including but not limited to photos, graphics, logos, videos, clips, and promotional material. Campaign: The time that you set to raise your funds. Services: The services Classmunity Provides to you, independent of any third party services or data. Terms: The agreement between the Founder, Supporter, and Classmunity in addition to all municipal, local, and state laws where the Founder is using the services and in accordance with Wisconsin law. Campaign Founders must be at least 18 years of age or have express permission to create a campaign from their school or school district. Campaign Founders can be anyone associated with a school or school district that has contracted with Classmunity for the use of the Classmunity platform. When signing up for a Classmunity account, you can choose whether you want to be a “Classmunity founder” (“Campaign Founder”) or “campaign supporter ” (“Supporter”). As a Campaign Founder you are responsible for your account and all of the activity and communications on your account. Classmunity prohibits the use of anyone else’s identity besides your own. When you create an account, you will need to create a user name and password. You may not need to provide Classmunity with a valid U.S. bank account. as Classmunity will distribute funds per the agreement with your school district and/or school. If your campaign has more than one founder, it is up to the Campaign Founders involved to determine which account creates the campaign. Classmunity will not divide the funds between multiple accounts, so it is up to the Founders to decide internal funding matters. Classmunity grants each Campaign Founder a limited, non-exclusive, non-transferable, revocable license to use the Services subject to such Campaign Founder's eligibility and continued compliance with the Terms. There is a five dollar minimum amount that you as a supporter can provide to a Campaign. The amount you give to a Campaign will be distributed within ten days of the end of the campaign, regardless of whether or not the Campaign achieves their goal. Fees are processed in two stages once by Stripe and once by Classmunity. The fees Classmunity charges are dictated by the agreement between Classmunity and your school/school district. First , upon the completion of your campaign, Stripe, an independent third party will collect the funds that you raise through your campaign. Stripe charges a 2.9% + $0.30 per transaction. This will be taken out of the funds before the money is transferred to Classmunity. Stripe is a separate website; Classmunity is not responsible for any charging errors, breach of security, or loss of funds by Stripe. Stripe is an independent service from Classmunity and the terms of service for Stipe can be viewed at: https://stripe.com/us/terms. Second , Classmunity will take a percentage of the funds as compensation for its services as dictated in the agreement between Classmunity and your school/school district. At the end of this process Classmunity will distribute your funds to the appropriate bank account within 10 business days. Classmunity will distribute your funds at the end of the campaign regardless of whether or not you reach your goal. Campaign Founders may post photos, videos, text, graphics, logos artwork and other audio or visual materials in relation to their campaign (collectively, " Campaign Founder Content"). By using the services, the Founders grant Classmunity a right to publicly display, publicly perform, store, reproduce, modify, create derivative works, and distribute Campaign Founder Content of any Campaign Founder on or in connection with the Services and our related marketing and promotional activities. Campaign Founders continue to hold all ownership interest in their Founder Content. Each Campaign Founder represents and warrants that its Founder Content and use of such Founder Content will not infringe any third party's intellectual property rights, proprietary rights, privacy rights, confidentiality, rights of publicity or otherwise violate these Terms or applicable law. If the Campaign Founder posts any prohibited or distasteful material in their Founder Content or any inappropriate campaign, Classmunity reserves the right to delete the content, campaign, and/or account completely and withhold distribution of funds. Examples of inappropriate content include but are not limited to, sexually explicit material, hurtful or violent language, blood, gore or harmful material, illegal material, or anything else Classmunity deems inseparable with the website’s policies and image. Breaking the law. Make sure all of your actions are in accordance with municipal, local, and federal laws. Scamming People. You also cannot use the information on Classmunity’s website to spam other people’s websites or computers. Harassment. Don’t harass other Campaign Founders or Supporters. Using someone else’s identity. Your email address and information must be your own. Don’t abuse other Campaign Founders or Supporters personal information. When you use Classmunity, you may receive information about other Campaign Founders or Supporters, including things like their names, email addresses, and postal addresses. This information is provided for the purposes of participating in a Classmunity: don’t use it for other purposes, and don’t abuse it. Anything else you or your school/school district wouldn’t want on your school/school district’s website. We operate with the permission of your school/school district, so don’t post something on the website that you wouldn’t want being shared with your school or school district. This is a professional environment and your actions could have a negative impact on others. By creating an account, you are allowing Classmunity to collect data that you provide to Classmunity, and permit Classmunity to use it for internal purposes. This MAY include personal name, phone number, and any other Campaign Founder data. This will NOT include bank account or password information. CLASSMUNITY (INCLUDING ITS AFFILIATES, DIRECTORS, OFFICERS, EMPLOYEES, AGENTS, SUBCONTRACTORS OR LICENSORS) IS NOT LIABLE FOR ANY INDIRECT, PUNITIVE, INCIDENTAL, SPECIAL, CONSEQUENTIAL OR EXEMPLARY DAMAGES OR, IN ANY EVENT, FOR DAMAGES EXCEEDING THE LESSER OF ONE HUNDRED U.S. DOLLARS ($100.00) OR THE FEES PAID TO CLASSMUNITY FOR THE TRANSACTION FROM WHICH THE CAUSE OF ACTION AROSE. THIS LIMITATION OF LIABILITY SECTION APPLIES WHETHER THE ALLEGED LIABILITY IS BASED ON CONTRACT, TORT, NEGLIGENCE, STRICT LIABILITY, OR ANY OTHER BASIS, EVEN IF CLASSMUNITY HAS BEEN ADVISED OF THE POSSIBILITY OF SUCH DAMAGE AND TO THE FULLEST EXTENT PERMITTED BY LAW IN THE APPLICABLE JURISDICTION. Classmunity has legal rights and protections for all of our intellectual property. You have the right to use our services, but you do not have the right to use our services for any commercial use without Classmunity’s permission. You may not use any of Classmunity’s intellectual property or concepts that are available on the website without permission from Classmunity. The website is presented as-is, without any specific warranty for the services we provide through Classmunity. You use the services at your own risk. The website and services are provided, “as is” without any warranties, expressed or implied. CLASSMUNITY SPECIFICALLY DISCLAIMS ANY AND ALL WARRANTIES AND CONDITIONS OF MERCHANTABILITY, NON-INFRINGEMENT, AND FITNESS FOR A PARTICULAR PURPOSE, AND ANY WARRANTIES IMPLIED BY ANY COURSE OF DEALING, COURSE OF PERFORMANCE, OR USAGE OF TRADE. NO ADVICE OR INFORMATION (ORAL OR WRITTEN) OBTAINED BY YOU FROM CLASSMUNITY SHALL CREATE ANY WARRANTY. If you do anything illegal or break any terms of this this agreement, you agree to defend, indemnify, and hold us harmless from all liabilities, claims, and expenses (including reasonable attorneys’ fees and other legal costs) that arise from or relate to your use or misuse of Classmunity. Classmunity reserves the right to assume the exclusive defense and control of any matter otherwise subject to this indemnification clause, in which case you agree that you’ll cooperate and help us in asserting any defenses. These Terms will be governed by and construed in accordance with the laws of the State of Wisconsin and the United States, without giving effect to any principles of conflicts of law, and without application of the Uniform Computer Information Transaction Act or the United Nations Convention of Controls for International Sale of Goods. You agree that Classmunity and its Services are deemed a passive website that does not give rise to jurisdiction over Classmunity employees, agents, directors, officers, or shareholders, either specific or general, in any jurisdiction other than the State of Wisconsin. You agree that any action at law or in equity arising out of or relating to these Terms, or your use or non-use of Classmunity, shall be filed only in the state or federal courts located in Milwaukee County in the State of Wisconsin, and you hereby consent and submit to the personal jurisdiction of these courts for the purposes of litigating any such action. You hereby irrevocably waive any right you may have to trial by jury in any dispute, action, or proceeding. These Terms and other material referenced in them are the entire agreement between you and Classmunity with respect to the Services. If any of these provisions are found to be invalid under the law, the illegal provision will be limited or eliminated to the minimum extent necessary so that the Terms otherwise will remain in full force and effect and enforceable. The failure of either the Founder or Classmunity to exercise any right provided for in these Terms in any way won’t be deemed a waiver of any other rights. The user is not currently registered. An account will automatically be created. What is a promoter page? Put a personal touch on the fundraiser with your custom message, image, and goal. Share your unique page and track progress toward your fundraising goal. Upload a personal image ? Set your custom message ?